Freilassung war dazu ein Artikel von Bei Ling, den ich übersetzt habe, in der FAZ, in der Presse und auf derstandard.at. Das Gedicht erschien 1987 in der von Yan Li herausgegebenen chinesischsprachigen Zeitschrift Yi Hang (oder Yi Xing, d.h.
den Mund aufmachen dürfen. Als Wegzehrung für den Rückweg haben wir ein paar Sonnenblumenkerne mitbekommen. @faz_net Weit hinter der chinesischen Firewall http://t.co/LIbIuTv 貝嶺 Bei Ling (June 25). http://derstandard.at/1308679661187/Die-Freilassung-Ai-Weiweis-Ai-Weiweis-Zukunft Ai Weiwei mit Maulkorb: Wie lange wird er das aushalten? Der Aktionskünstler ist wieder auf freiem Fuß, aber unter scharfen Auflagen: Gibt es echte Freiheit für ihn nur um den Preis des Exils? According to Xinhua and Global Times, the newly published second volume of “History of the Chinese Communist Party” (1949-1978) is “seen as objective”. So what’s the objective of this book? What are the objectives of this new “objective” party history? Was it written by party members? Does anyone among them, or among the people who planned, published, and distributed this book, think the PRC should evolve into something different from a one-party dictatorship/autocracy? (I find it hard to believe that many non-party members would use their own money to buy such a book. Or is it really that different? Why was it published, then?) Which major bookstores have had their sales rankings dominated by this book? Ok, the main objective seems to be seen as objective. “Experts say that objectivity, a founding principle of the CPC, was virtually banished during the late 1950s and 1960s, when “extreme leftist” thought dominated the governing ideology of the Party.” Founding principle? There must be some historians who can answer this question. Anyway, they still write their party with a capital P.
PRC. Because of that ping-pong tournament between Nixon, Zhou Enlai, Mao and Kissinger, or something like that. Yes, sports events have always been very important. So there was pressure on Taiwan to open up politically, to democratize. They couldn’t just go on calling themselves The Free China team. No-one was ever going to help them liberate the Mainland anyway. So the Chiang Ching-kuo administration eventually lifted martial law in 1987, and allowed real opposition. A real opposition party. In 1988 or 1989, you still had to be a Party member (GMD/KMT) to get into certain positions in Taiwan. In 1988 or 1989, even very liberal Party members still said that in 1947, maybe 200 people might have been killed after the February 28th incident, but it was an armed uprising anyway. In 1991, President Li Denghui publicly admitted that probably more than 20.000 people had been killed in 1947 by government forces, and apologized to surviving relatives. wouldn’t that mean one-party autocracy would have to be abandoned at some time? In 2011, we’re having 90 years of CCP, in addition to 45 years after 1966, the beginning of the CR. In 2009, we’ve had The Founding of a Republic (1949), and in addition 1959 (famine), 1969 (CR), 1979 and 1989 (In 1979, economic reform was ushered in under Deng Xiaoping, who prevailed over Hua Guofeng in the late 1970s, although Hua had been appointed by Mao. Does that mean Hua and Mao were part of the “‘extreme leftist’ thought [that] dominated the governing ideology of the Party” […] “during the late 1950s and 1960s”?). The student demonstrators in 1989 explicitly stated in slogans on banners etc. that they supported the CCP. Even after they were called counter-revolutionaries in the The People’s Daily. (See the article by Su Yang 蘇陽 in the HK Xin Bao). But because protest leaders emphasized loyalty to the state, three peasants who hurled red paint at the Mao portrait at Tian’anmen were apprehended by the students and handed over to Public Security. They were from Hunan, where Mao came from. They got 17-20 years. 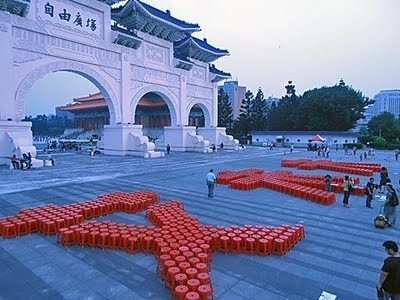 After the massacre of June 3rd and June 4th in the streets of Beijing, who would still think that political reform would be possible under the Party? Communist Party seen as objective in writing its history” – doesn’t that sound like “Vatican seen as objective in writing its history”? Yan Lianke cannot publish his latest novel Four Books in mainland China, because it’s about the Great Leap Forward famine. Opposition party founder Liu Xianbin has been sentenced to another 10 years in March. He has been sentenced to 26 years since 1989. There are a few other people like him. They are not as famous as Liu Xiaobo and Ai Weiwei. And there are people in detention or in labor camps for political reasons who are not intellectuals or dissidents. Like Ai Weiwei’s cook and his driver. Anyway, would anyone call the present political and social climate in China hopeful? So what are the objectives?